Today’s page is short, just a handful of stories from my racing days. The leather suits motorcycle road racers wore in the 70’s had very little airflow and were very uncomfortable on hot days. They didn’t have the perforated leather racers use today. The suits held the heat in quite effectively. Like many Americans I’m a blend — Irish, English, German, and Scottish, with a touch of Nordic. These are all cool climate cultures and when I get hot I sweat. A lot. Thick leather with padding, cloth liner, and poor ventilation equals HOT. In 1973, when I first started racing, sports drinks were fairly new and heavily advertised. I scoffed at them, thinking they were an attempt by large corporations to convince people to pay big money for flavored sugar water. I brought ice water in a cooler with me to re-hydrate after racing, which worked fine on a normal mid-80 degree race day. One day there was a heat wave when temperatures soared to 100 degrees. After two practices and a race on the Ducati Diana I had lost a lot of fluids and was feeling very thirsty. I glugged down some of my ice water as soon as I got off the track, and the rest after changing into shorts and a dry t-shirt. The water tasted great but I still felt thirsty. After a half hour wait I added a soda. Still no relief. I walked to the snack bar and got a large iced tea and forced that down but after 20 minutes rest in the shade I still had a ferocious thirst. By then I was sloshing audibly as I walked and becoming a bit desperate. I passed a friend’s pit and noticed a quart of Gatorade in his cooler. I was beyond pride by then and asked for some. On approval I glugged down two swallows, maybe half a cup, which was all I could cram in after all the other liquids. It tasted odd, kind of like sweetened, lime flavored sweat. Another 10 minutes rest in the shade and the thirst faded away. It worked! Damn! Attitude adjusted. This was a Formula 750 race started in, as I recall, 1972. It was originally planned as a 200-mile race to be the west coast rival to the Daytona 200. It was pointed out to the organizers that 200 miles at Laguna Seca in September was not the same as 200 miles at Daytona in March, and racers would be dropping from cramps, heat stroke and/or sheer exhaustion before the end of the event. 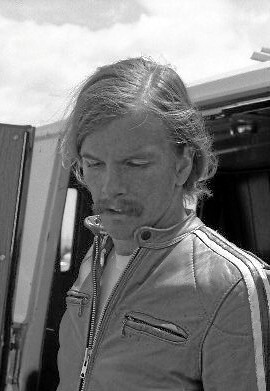 Cal Rayborn won the 1972 race on a Harley Davidson. Second was Gene Romero on a Triumph with Kenny Robert’s Yamaha getting 3rd. Riverside International Raceway had a back straight, from turn 7A to turn 9, that allowed the throttle on the AFM’s Production class bikes to be held to the stop for nearly a half mile. The back straight wasn’t dead straight, however. There was a left-hand dogleg kink near the end that could be taken flat out in top gear by all but the very fastest bikes. We could build up a pretty good speed before needing to slow for turn 9. One race day I had just gone out for the Heavyweight Production practice (550cc, 750cc and Open). It must have been on the first lap of the session because the bikes were still pretty bunched up. I was on my Ducati 750 Sport, getting ready to pass Greg, at turn 8. However. he did something unexpected. Instead of going left he sat up and veered right. I knew something was wrong because he was a good, reliable rider not prone to squirrelly moves. I raised my hand, slowed, sat up and looked around. Later in the day I was chatting with some of the turn workers and this incident came into the conversation. “Was he OK?” I asked. The worker who was the first to reach him chuckled and told me this story. His Kawasaki Z1 went into a big wobble when he hit the dogleg and spit him off. He eventually stopped sliding without hitting anything, got up and moved behind a hay bale and sat down again. She found him sitting, dazed — typical after an incident like that. He was probably taking mental stock, counting arms, legs, fingers, etc. “Yeah,” he mumbled, “OK,” in that way racers do when they still haven’t quite returned to the present after a big get-off. Then the racer’s eyes snapped back into focus and he looked at the still smoldering elbow and knee pads of his leathers. He turned to the turn worker and said, “Excuse me. Mind if I smoke?” She knew he was going to be fine. I finished in 4th place in the 1977 Laguna Seca Superbike race. To my surprise the marshals directed me into the winner’s circle along with the top three finishers. I was told they wanted to have Dale’s bike nearby in case one of the top three bikes was disqualified. I had never seen an AMA post-race inspection so I went with the bikes back to the AMA garage. While I was there a gentleman approached me with a program in hand. He turned back towards me, stopped and said “Oh,” and blushed before continuing on his way. I was about to bust a gut trying not to laugh and embarrass the guy any further. When he got out of earshot I started laughing. Some spectators who witnessed the event also joined in. “My first moment of fame, and it was a case of mistaken identity,” I said, causing a few more laughs. Oh yeah, the first three finishers were all declared legal and my 4th place stood. McLaughlin won on a Suzuki, Cook Neilson’s Ducati was 2nd and Reg Pridmoe was 3rd on a Kawasaki. My first chance to read one of your blogs, Paul. Enjoyed it! I feel like I stumbled onto a pile of old motorcycle magazines from back in the day… this blog is fantastic!